I picked up this secretary on a trip to the Outer Banks a few weeks back. Those of you who follow my facebook page, may remember how I came across a good deal so I just had to cram it in the back of our Corolla. Where there is a will, there is a way! The secretary looks like it's in beautiful condition here and the drawers had pretty wood, but the top had cracking veneer and the inside was a mess so it ended up getting painted. I added some chalkboard details for the drawer fronts and a place for messages, notes...and yes, that little message was inspired by that cute little song that my girls love to dance around to! The outside of the secretary was painted in ASCP Graphite (love that color) with Provence painted drawer pulls, custom hand-painted phone graphic on the front and sealed with clear wax. It's nice to mix it up and paint some fun pieces every now and then. By the way...I've finally found a place to sell my furniture and other goods here in Raleigh...more on that to come! so cute! I love it! 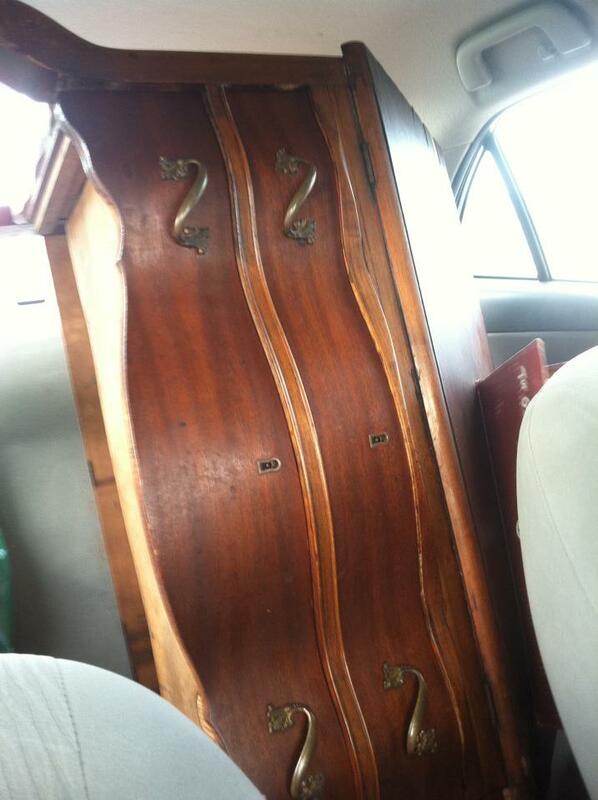 I have almost the identical secretary, but it is just wood, and a bit boring now that I've seen yours lol. My 8 and 5 year old girls love that song too. Now I'll be singing it all day long haha. Kristen...that phone secretary cannot get any cuter!! !...Oh I love it! 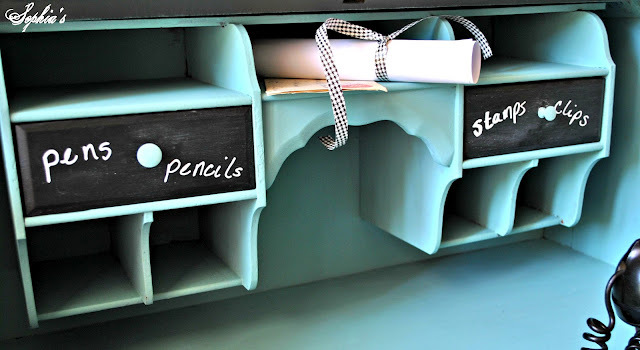 !...You are so very creative...love the colors and great idea to paint the drawers with the chalk paint....Congrats on getting a place in Raleigh...you know I will be there!!! Im seriously watching Carly Rae singing Call Me Maybe on Ellen as I read your post lol. The secretary is so fun!! 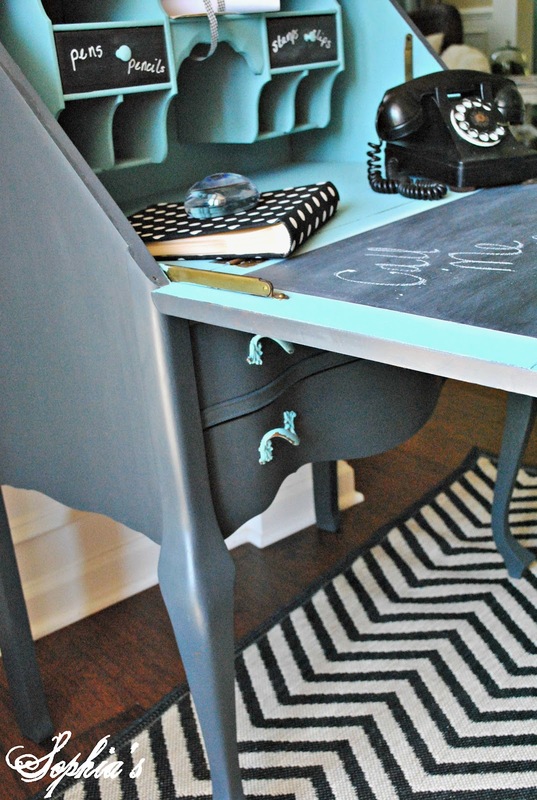 What an awesome makeover - and love how you accessorized it!!! Kristen, you are so talented and have a vision like none other! This is absolutely adorable!!! I'm looking forward to hearing all about your place in Raleigh. Exciting for you, I know! Kristen, you are so talented and have a vision like none other! This is absolutely adorable!!! Looking forward to hearing all about your place in Raleigh. So exciting for you, I know! i adore this! i am about to get a similar piece and you are giving me fun ideas! The secretary turned out too cute. Love the color that you picked and also the chalkboard details really give it character. Love it girl!! Your work as usual is perfect, and so creative..and fun=)...Loving and wanting the chevron black and white rug too...might you tell me where you got it?.. Beautiful!! Can't wait for your new space!! We are so excited! So cute!! Thank you so much for sharing at Feathered Nest Friday! This table turned out super super cute!! That is one quirky, fantastic secretary! You were definitely inspired to be super-creative. 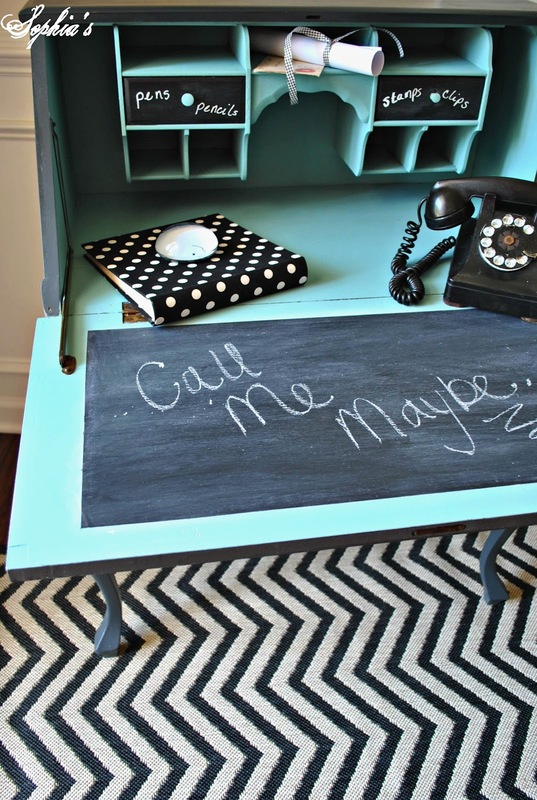 Love this piece, but despise that "Call me maybe" is now rolling around in my brain! Amazing paint job! Love the designs and the fun you had with it. The colors are a nice change of pace, too! I'm your new follower. Hope you'll stop over for a visit at Quirky Vistas and follow as well if you like! It turned out so cute. I love the hand painted graphic. 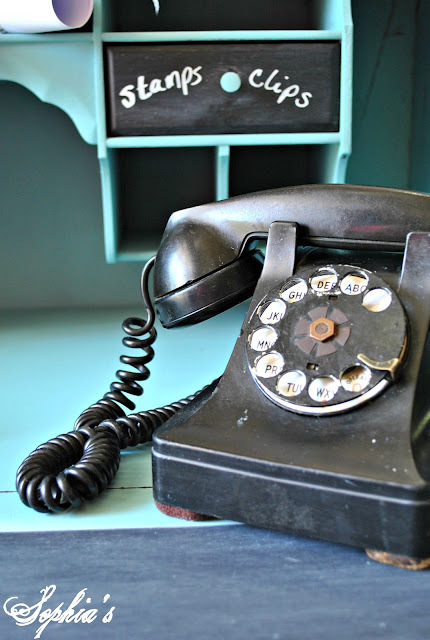 Unfreakin' beautiful, amazing paint job, love the telephone, great color. I can't say enough about how much I love this. Thanks for sharing your creative inspiration with Sunday’s Best – you helped make the party a success! Modern and crafty, this makeover has the wow factor! The graphic is really appealling and sucked me right in! SO cute! 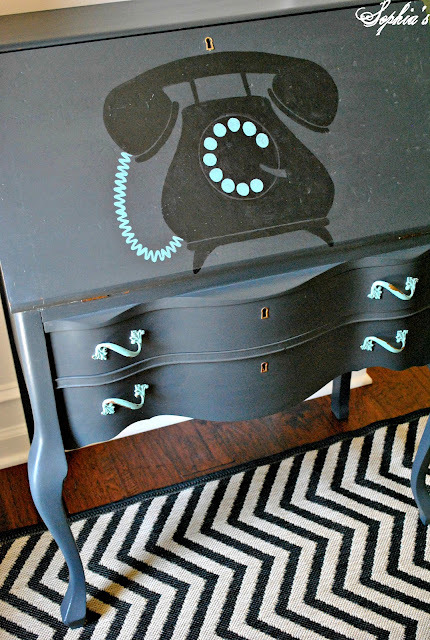 This is such a fun & clever piece of furniture! The phone graphic that you painted on it looks great (and whimsical! ), and the chalkboard on the inside of the pull-down is a fantastic idea. And the inside painted turquoise.... love! I absolutely love the colors and the phone! Totally creative and pretty! CUTE! so original and I love the colors you chose for it. Great work! So cute! Had to pin it! I just saw this on Shabby Nest. I absolutely love it! 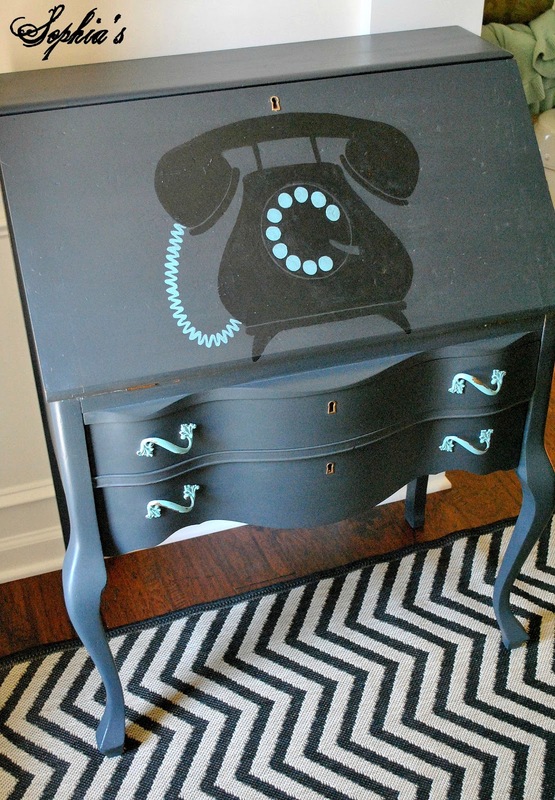 The phone is cute enough, but the desk is totally fantastic. Great job! This is the coolest thing EVER. Love ASCP and I'm so impressed with your handpainting too! This is so adorable!! I have a secretary in my garage that I have not been sure what to do with, I am so inspired by your project. Pinning this one! Visiting from Frugal Friday. Congrats - your gorgeous Vintage Phone Secretary has been featured on Sunday's Best today! Come grab a feature button - you deserve it! Hi Kristen: Congratulations on being featured at My 1929 Charmer! 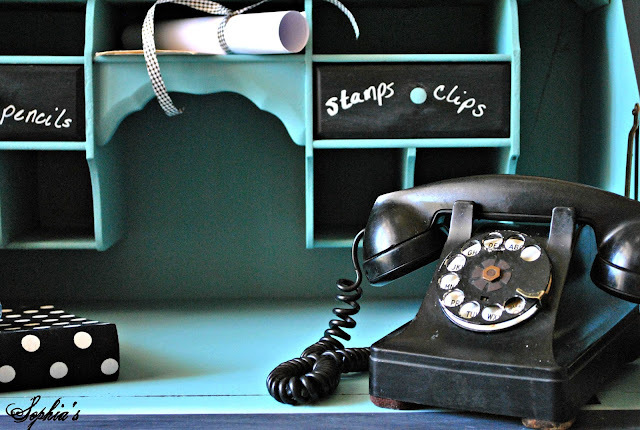 I adore old telephones, so I love your secretary redo--it's lovely! I am totally in love. My dad worked for "Ma Bell" and we had antique, vintage and unique phones decorating our house, even a phone booth with a pay phone sat in one corner of our family room. 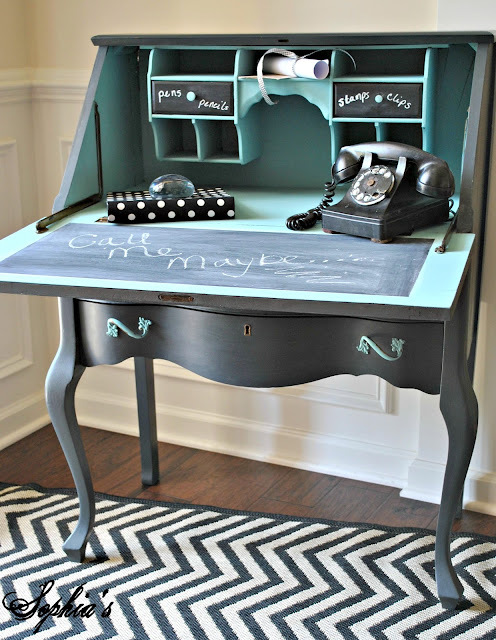 This desk would have fit right in my parent's decor. Thank you so much for sharing.